In late March 2018, President Donald Trump and then-Defense Secretary James Mattis discussed the idea that the U.S. military could help the president achieve one of his cherished aims: The Pentagon would build a wall across the country’s southern border. In the weeks and months that followed, a variety of reports seemed to raise questions about whether the U.S. military was in any position to be dedicating money or personnel to a border wall. There was, for instance, an April 2018 Government Accountability Office report wondering whether the military even had adequate data to assess its own state of combat readiness. The Air Force and Marine Corps both received “weak” readiness ratings, with the Air Force mired in a crippling shortage of fighter pilots (more than 1,000) and fighter aircraft (nearly 300). The average fighter pilot is currently flying fewer than two times a week, severely degrading combat readiness of the force. Of the U.S. Army’s 31 brigade combat teams, the building blocks of American ground combat power, only 15 are considered “ready” and only eight of those are “fully ready.” Army leaders have said it could be 2022 before the service gets to its goal of two-thirds of its active BCTs ready. The Marine Corps maintained its 2018 “weak” comprehensive rating, with approximately half of its amphibious ship and tactical aircraft fleets unavailable for current operations. The state of America’s military readiness is no abstract question. A year before the 2018 Heritage Foundation report on military strength, the Navy suffered back-to-back disasters when 17 sailors died in two accidents involving destroyers in the vaunted Seventh Fleet. The state of the fleet’s readiness came in for withering critiques in the aftermath of the accidents. “In general, we’re asking too few ships to do too many things,” Sen. Roger Wicker, R-Miss., said at a meeting of the Senate Armed Services Committee after the Navy produced a series of reports on the fatal accidents. There are, of course, competing cases for what the U.S. military most needs, and more money isn’t the be-all and end-all. Elizabeth Warren, the Democratic senator and all-but-declared candidate for the presidency in 2020, made such a case in an essay recently in Foreign Affairs magazine. The wisdom of the military taking responsibility for building a southern border wall is front and center again. Trump is said to be considering declaring a national emergency in order to make way for the military to build the wall. The president’s suggestion that he can build the wall by declaring a national emergency would likely hinge on a little-known section of the U.S. Code governing the military. Section 2808 gives the defense secretary the authority to undertake military construction projects ‘not otherwise authorized by law’ to support any troops deployed in a national emergency requiring the use of the armed forces. The law limits the spending in such cases. The Pentagon can draw upon only the money that Congress has appropriated for military construction projects but which has yet to be committed by contract to projects. These are known as unobligated funds. Sometimes, they are not all spent. According to a congressional aide, there is about $10 billion left in unobligated funds for military construction in the current fiscal year’s defense budget, in addition to some $13 billion that has rolled over from previous years. The money, however, has been appropriated for specific projects. This aide, and another one, spoke on the condition of anonymity because they are not authorized to speak publicly about the issue. The Pentagon’s leadership would be forced to decide which of the projects in various stages of completion should see their funds diverted or cut, according to the congressional aide and a defense official. Even then, he seemed to be keen on the military using its alleged riches to get involved in the wall. 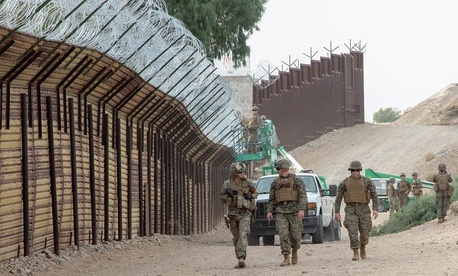 Will Fischer, director of government relations for VoteVets, a liberal veterans advocacy group, said he thought any military involvement in the construction of a border wall would have consequences for the Pentagon’s state of readiness. However, Gordon Adams, professor emeritus at the School of International Service at American University who was the senior White House budget official for national security from 1993 to 1997, said he doubted any military commitment to building the wall would have a direct effect on readiness. “I don’t think it will be done by the military; they won’t deploy active-duty military,” Adams said. “The way it’ll work in the real world is it will probably be the Army Corps of Engineers that oversees it and the private contractors doing it. Adams said the Pentagon typically had $15 billion or $20 billion “worth of balances” for projects like building bases, barracks or testing facilities. Mattis, at the time of the budget signing, was also excited about the money available — but mainly for rebuilding lost capacity. “We do intend to get the planes back in the air, fully staffed squadrons back in the air, ships back to sea and the new gear built,” Mattis said to reporters. “It’ll take years,” he added. The country may be about to find out what effect the military building a wall has on its effort to rebuild its fighting power.